Really want a phablet? Don’t have the funds to buy a Samsung, HTC, or LG device off contract? 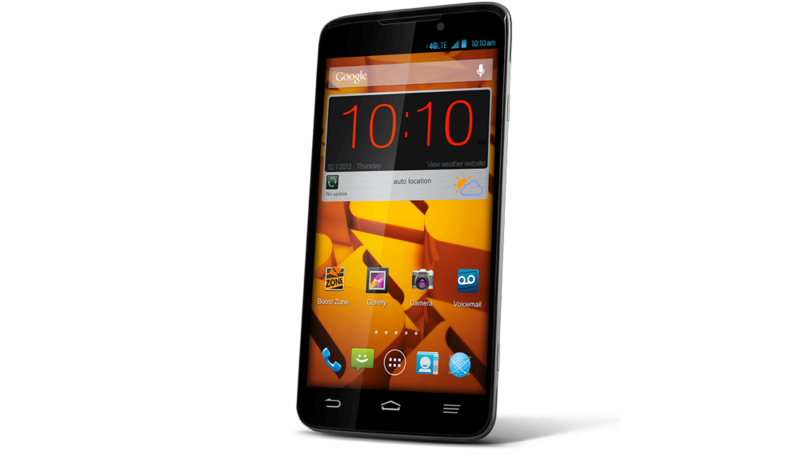 Boost Mobile may be your savior, as they announced the Boost Max today, a phablet device sporting a 5.7″ display for just $299.99 off contract. While you may be a little bummed by the device’s specs, there is just no denying a massive display to enjoy all of your gorgeous content. As for specs besides the 5.7″ HD IPS display, the phone comes with an 8MP rear-facing camera, a 1MP front-facing shooter, Android 4.1 “Jelly Bean”, connectivity to Boost Mobile’s 4G LTE network, a 1.2GHz dual-core processor, 1GB of RAM, and a 3,200mAh battery. This is pretty much what you would expect from a device that features a big screen on a small budget, but it’s not that bad. The only things that might come back to bite you are the processor, amount of RAM, and the fact that it’s running only Android 4.1. Will Android 4.4 ever come? Our guess is “no.” At least it looks like a pretty pure version of Android with no crazy Boost skin on it. Anyone here rocking a Boost Mobile plan?